The armoire is supported by a 2 x 8 base that is reinforced by blocks at all four corners. The blocks are cut and attached to the armoire first. Cut four corner blocks (00) from 2x8 pine, each 6 inches square. 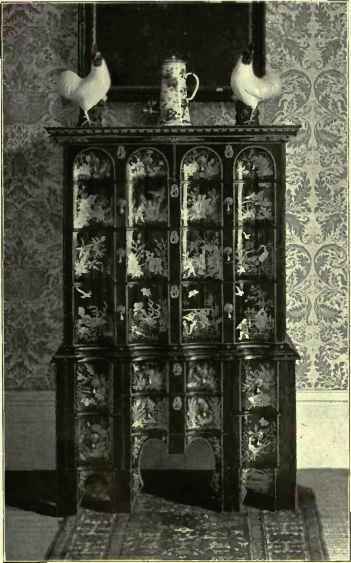 Position them flush with the outermost corners of the bottom of the armoire. Then, using glue and 3-1/2-inch-long screws, screw through the blocks into the 2x2 horizontal supports and the 1x4 trim pieces at the bottom of the armoire, as shown in Figure 16. Cut two front/back base pieces (PP) from the 2x8 pine, each 52-1/2 inches long. Stand each front/back base piece (PP) on edge, and miter both ends at a 45-degree angle. Glue and screw the mitered base pieces (PP) in place, overlapping the bottom of the armoire by 1 inch. Screw them securely to the bottom of the armoire and to the corner blocks using 3-1/2-inch-long screws. Cut two side base pieges (QQ) from 2x8 pine, each 26-1/4 inches long. Standing the side base pieces (QQ) on edge, miter each end at a 45-degree angle. Glue and screw the side base pieces (QQ) in place, overlapping the bottom of the armoire by 1 inch and matching the miters on the front/back base pieces (PP). Screw them securely to the bottom of the armoire and to the corner blocks (00). Again use 3-1/2-inch-long screws to screw into the corner blocks (OO). Using 3-1/2-inch-long screws, attach the front/back base pieces (PP) to each side base piece (QQ) at the four corners. Insert two screws on each side of all four corners.